Staring down the collar and harness aisle or your favorite store, or searching for the endless variety available online can be daunting for even the most experienced pet owner. How could you possibly choose? Not every collar will be appropriate for every dog and no single option is the best when it comes to choosing your dog’s collar or harness. In choosing what type of collar or harness to use, you’ll need to consider both your own lifestyle and that of your dog. Are you and your dog very active? Does she like to play in the mud or water often? Do you spend a lot of time outdoors in the early morning or evening when visibility is reduced? You’ll also need to consider your dog’s physical characteristics and behaviors. Is he a breed with a wide neck or narrow head? Is your dog well trained or does he begin to pull as soon as a leash is clipped on? In this guide, we’ll cover the wide variety of collars, halters, and harnesses available and how to choose the one that will work best for YOUR unique dog. Traditional collars are the most common and the most popular. They’re available in a wide variety of fabrics, typically nylon, leather, cotton, or rubber. Also known as flat collars, they simply fit around your dog’s neck by either a buckle or clip and are adjustable to a range of sizes to accommodate a growing dog. When choosing a traditional collar, think of your dog’s lifestyle and choose accordingly. If your dog is outside or is walked during early morning or at night when visibility is reduced, look for a reflective collar. If he tends to play dirty, look for a waterproof or rubber collar that won’t get funky and moldy after a few trips to the lake. These collars are best for dogs that have been trained to walk properly on a leash without pulling. You’ll also want to consider the ratings and reviews from other dog moms and dads who’ve put the collar to the test. Head over to DogProductPicker.com to find the top rated dog collars (and thousands of other dog product reviews to help you pick the very best for your best furry friends). 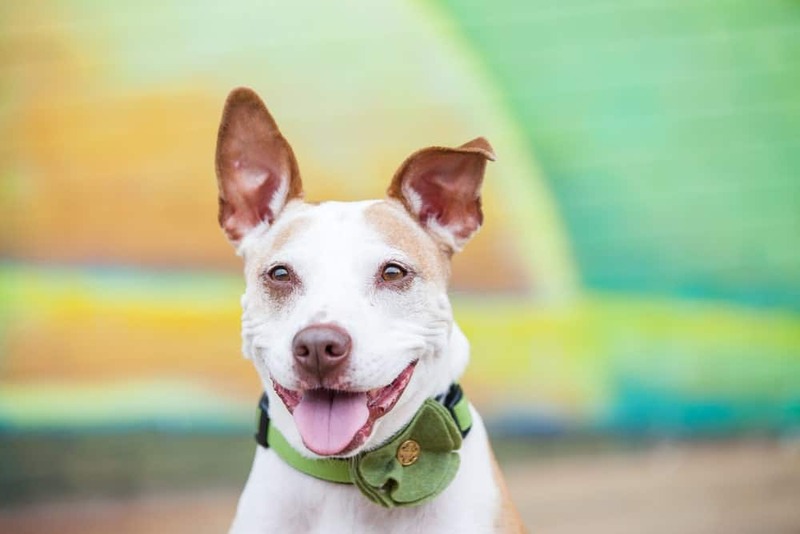 Benefits of traditional collars: Because traditional collars come in such a huge variety of colors, patterns, and fabrics, and they’re typically quite affordable, many pet parents choose several and change them to suit their mood or the season. Another great aspect of traditional collars is their ability to be customized! Dress up any collar with flowers or bow ties that clip on, fun novelty dog tags, or bandanas that slip over the collar and are more easily held in place. Risks associated with traditional collars: Studies have shown that dogs that tend to pull on a leash attached to a traditional collar can suffer serious tracheal damage as a result. 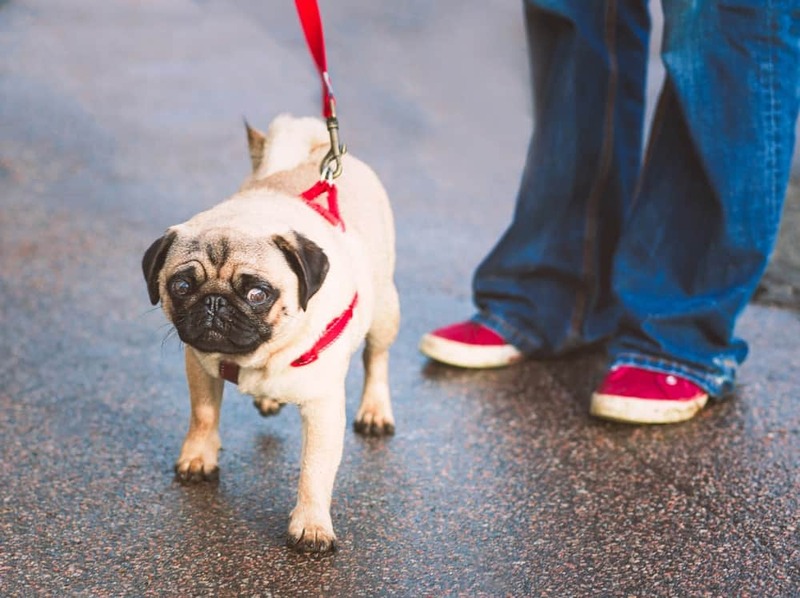 If your dog is an avid leash puller, consider using a harness during walks. Additionally, traditional collars can pose a choking or strangulation hazard if a dog is left unattended while wearing one. Because collars traditionally carry important identification, consider using a break-away collar while your dog is unattended and make sure he’s microchipped. Training collars are designed to assist pet parents in controlling a dog that either isn’t trained or is in the process of being trained to walk nicely on a leash or for dogs that tend to back-out of traditional collars. Martingale collars. 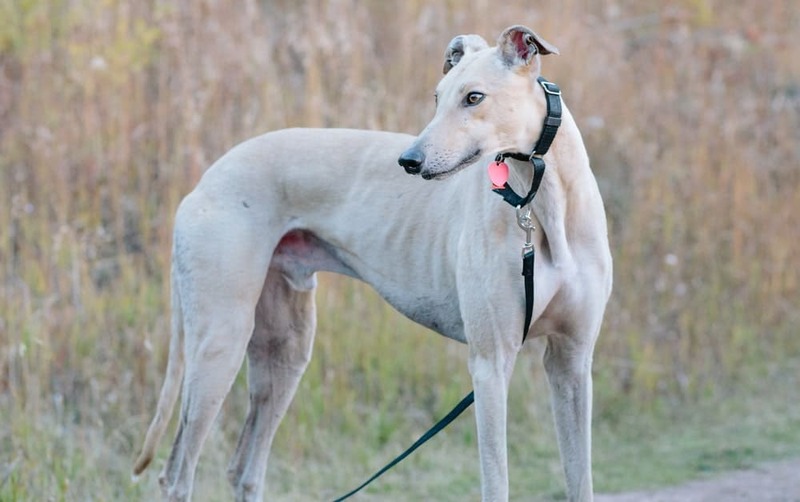 These collars were originally designed for pets that have a wider neck and a narrower head, like Greyhounds, or escape artists that have learned to back out of their collars. These collars can either slip over the head, or can be a combination of martingale/buckle. Martingale collars are made with an extra loop of fabric or chain that tightens as the dog pulls. Although they tighten with pulling, they’re designed in such a way that, when properly fitted, cannot choke or strangle the dog, but simply keep the collar from slipping off. Choke/slip collar. Choke or slip collars, also known as choke chains, are collars made of either chain or rope that has been looped before being put around the dog’s neck. If a dog pulls, the collar tightens. These collars are used in aversion or punishment style training and their use is very controversial. Unlike martingale collars that can only tighten so much, choke collars can very easily cause choking or strangulation and are not recommended. Prong/pinch collar. Another controversial training collar used in aversion or punishment style training, prong collars were originally designed to mimic the correction a mother dog would give her puppy, by “biting” the neck. Lined with teeth-like prongs, as a dog pulls, the prongs squeeze around the dog’s neck with the purpose of giving a correction to stop the pulling. Prong and pinch collars have the potential to cause serious damage when used improperly and should be avoided whenever possible. Head halter. A head halter is a type of harness that is fitted to a dog’s muzzle to prevent pulling on a leash and to provide better control by the owner. When fitted and worn correctly, a dog wearing a head halter should be able to eat, drink, and pant without problem. A head halter is not a muzzle and will not prevent aggression. Instead, it redirects a dog’s head from the direction they’re trying to pull. Benefits of training collars: Martingale collars are a suitable solution for owners of breeds that can’t wear traditional collars due to the shape and size of their head and neck. And, head halters have been used safely and effectively by pet parents as a tool to train their dogs to walk nicely on a leash. Although choke collars and prong collars may show immediate results in effectively stopping a dog from pulling, they do very little to address the lack of real training. Risks associated with training collars: Choke chains, slip collars, and prong collars should only ever be used under close supervision of a trained professional and only as an absolute last resort. Highly controversial, many believe these collars should be banned entirely as the risk to severe injury if they are misused or worn incorrectly is very high. Further, recent study by animal behaviorists has shown that training with these types of aversion techniques may have immediate results, but have little effect on long-term training and can actually lead to aggressive behavior. There are two basic types of harnesses, standard harness and no-pull harnesses. Both types are available in a variety of fabrics, colors, and sizes to properly fit any size or shape dog. Standard harnesses have a clip for the dog’s leash either on top near the neck or somewhere along the dog’s back. No-pull harnesses typically clip on the dog’s chest so that if they pull on the leash, they are pulled toward the side instead of effectively pulling in the direction they want to go. Benefits of harnesses: When fitted properly, harnesses can be very comfortable and unobtrusive to a dog’s mobility. The main benefit of using a harness is to relieve pressure from a dog’s delicate neck and trachea where collars can cause damage. 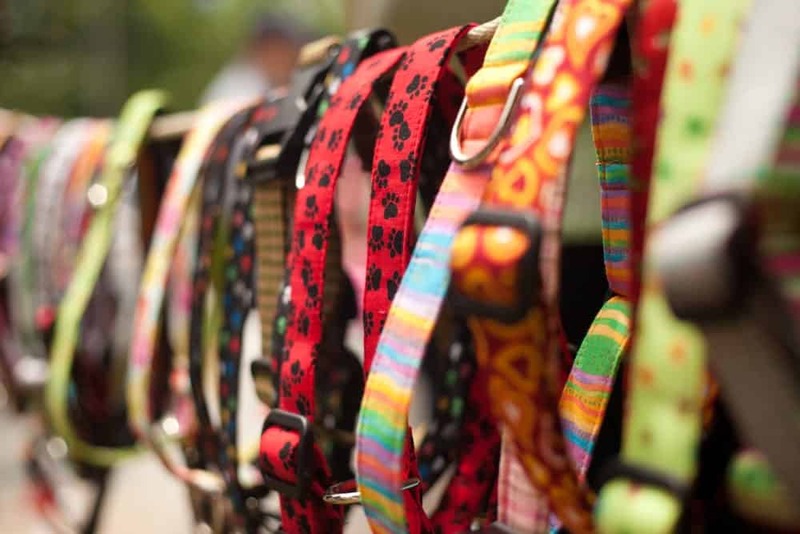 They’re also a necessity for certain breeds with very short necks and faces, like Pugs or Bulldogs, that are difficult to fit properly for a collar. No-pull harnesses are an excellent training tool for dogs that tend to pull on their leash. They quickly learn that pulling does not get them closer to their destination any faster and actually takes them slightly off track. Many dog owners find immediate and lasting success in loose leash walking after only a few training sessions with a no-pull harness. Still, finding the harness that’s right for your dog can sometimes be a challenge. Refer to DogProductPicker.com’s in-depth dog harness reviews to find the perfect fit! Risks associated with harnesses: When not fitted properly, harnesses can be very easy for a dog to escape or literally walk right out of. If your dog is a harness escape artist, combine a traditional collar with a harness along with a leash that clips to both to prevent escape. Additionally, harnesses that are not properly fitted can cause sores, abrasions, or hot spots to develop, usually around the armpits. And, standard harnesses, as opposed to the no-pull type of harness, can make a pulling dog actually pull harder. Dogs have a natural “opposition reflex” that causes them to pull or push against pressure points on their body. If a harness puts pressure on your dog’s chest, he will naturally push against that pressure – think of sled dogs! Their harnesses are worn across the chest and attached to the sled from behind, causing them to push against the harness, thereby pulling the sled. If you don’t want to be pulled like a sled, opt instead for a front-clipping no-pull harness. Which type of collar, halter, or harness do you use for your dog? Please share your experiences in a comment below.